on opposite side of ch, 1sc in each of the next 4 ch, 1sc in last ch..
Rnd 1: Working in the back loops. 1Hdc in each back loop around. Ch 1, do not turn (32 hdc) Fasten off CC and attach MC. brim a little puffy). Fasten off and tie in all ends. sides of cupcake. Fastern off leaving a long tail to sew with. Row 1: With white and C hook, ch2, 3 sc in 2nd ch from hook. in next st, 6sc in next st, slst in next st, 6sc in last st.
in next st* rep bet *’s to others side of frosting. Slst to join. Fasten off leaving a long tail to sew with. join. Fasten off leaving a tail to sew with. on the front toes as desired. You can sell any items that you make from using my patterns, but you are responsible for your finished items that you sell. Please do not recopy, rewrite, resell or redistribute this pattern as your own or in any other form. I already emailed this link to someone. Thanks Sandy! That would be me. These are so adorable!! I love how they coordinate with your blog wallpaper right now. :) Thank you so much for sharing! 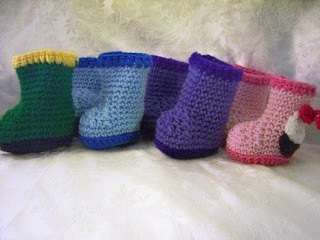 These are awesome - the prettiest booties I have found lately - I've a new grandson to crochet for and this will be on my list to do. Thanks! These are so cute. I'm going to have to make them for my new grandson and grandchild due in Dec. Thank you. Hi Sandy, These are the cutest booties I've seen in a long time! I'm going to make them for my Great-Grandniece in CA. I'll be watching your blog for more terrific patterns (& discounts), so keep up the good work, & thank you. These are adorable! Thank you for the free pattern!! Going to have to try and make some! I LOVE this pattern. I made a pair for my daughter's coming home outfit in December. She looked absolutely adorable! Thanks for sharing! The pattern is really cute, but the music is annoying. No, I don't believe there are angels among us, and I resent being forced to listen to such nonsense. These are ADORABLE! I have a 5 year old niece that would like a pair for her birthday... how would I convert them to a larger size for her? Thanks! Haven't tried the pattern yet but I love the music. Thanks for blessing those who appreciate it and forgive those who just don't understand what He is all about. The pattern says a D hook is needed but the detailed instructions say to use a C hook for the cupcake top and bottom. Which hook should I use for the cupcake top and bottom? I love this song and I will pray for anyone who doesn't believe in angels. Thanks for the pattern it is very cute and I love your etsy store also. Love your stuff!!! Thanks for sharing!!! i made these as a gift and posted a picture on fb of my finished product and now i have all my friends who are expecting wanting a pair. thank you for sharing. Thank you for this pattern, I just made a pair for my 12 month old using a size 8 hook, ok so the stitches are massive but they were so quick to make, I might make another pair with a chunky weight wool. They are so cute and so simple, so kind of you to share it! I just made these, but is it just me? Aren't these a little lopsided? You have twice as many SC on one side than the other side. (e.g. in row 4 you have 15 sc, then some decreases, then just 5 to finish the row.) Are mine the only ones that came out a little off? Can someone help me? So I have tried and tried 3 times now and can not figure out what I am doing wrong on rows 2 & 3. On row 2 I had a HDC to get 24 stitches and on row 3 I get 32 stitches like 5 stitch away from the end. Did anyone else have issues? I just tried to make one of these, and I got where you make the top part of the boot and I realized mine came out really lopsided- the front of the sole is about an inch off from where the front of the boot part ended up?